For over five hundred years, humanity has sprawled across the galaxy, forming fractious empires and deadly regions of lawless space. In the midst of brewing tensions, disgraced Commonwealth pilot Rex Vahl is tapped for a suicide mission: infiltrate an interplanetary power known only as the “Hegemony” and discover what hides behind their veil of secrecy. What does Rex have on his side? His co-pilot is a former prostitute with tiger-striped skin. His gunner is a traitorous ex-nobleman wanted by his countrymen. His engineer is a laid-back cyborg exiled for asking one too many questions about God. Add in a woman genetically engineered to have no free will, and you get his motley crew. Armed with only a souped-up freighter, Rex blasts off to pursue rumors of a mysterious Hegemony ambassador on the planet of Cordelia. To get there, he and his crew must cross the Chaos Quarter, a tumultuous territory defined by tyrants, pirates, and religious extremists. Even if they survive the journey, the ambassador could prove deadlier than any enemy they face along the way. But when Rex discovers that the Empire of Europa—the Commonwealth’s greatest foe—has agents skulking in the shadows, he realizes his mission is no longer a secret. And if he secures his prize now, the intergalactic fallout could unleash the most deadly war the galaxy has ever seen. Outnumbered, outgunned, but never outclassed...a motley bunch takes on two superpowers in this scifi action-adventure. 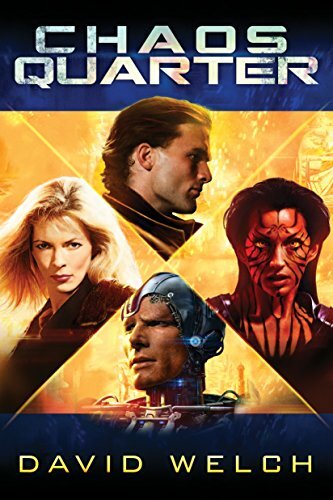 A disgraced pilot, tiger-striped prostitute, traitorous nobleman, and laid-back cyborg take on a race of body-hopping genetic supremacists. CHAOS QUARTER, available on Amazon.